10/21/2008Share this story on Facebook! instead of what within these walls of death. the names of Love, close whisper to far shout. to crumble into dust as he grows old? to every trembling smile, each waking eye. Professor Machan teaches several belly dance classes, including one at Longview, the residential senior community in partnership with IC, and another at the Community School of Music and the Arts in downtown Ithaca. Professor Machan Wins National Competition! Professor Katharyn Machan's 30-page manuscript, When She's Asked to Think of Colors, has won a national competition hosted by Byline magazine. The manuscript will be published by Palettes and Quills Press in 2009. Find the Intercom story here. Oh, and she’s also a belly dancer. See Professor Machan in action. This belief in poetry as a performance art is still a bit revolutionary for some. Even Machan’s close friend Delilah, herself a belly dancer, doesn’t fully understand it. “I have written a book about her called Delilah’s Veils,” she says, “and Delilah said, ‘Poetry’s great, but you know, why say it if you can move it?’” Indeed. Machan has been bridging this divide between words and dance for almost 40 years. 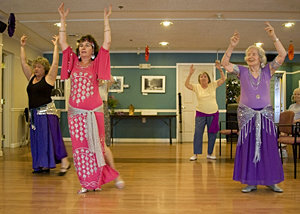 Professor Machan has taught a belly dance class at Longview, an adult residential community, for years. Machan’s creativity often crosses the age gap as well. 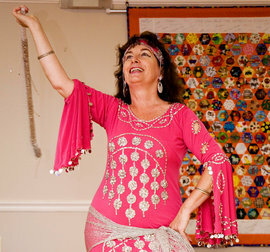 She teaches weekly belly dancing classes at Longview, a local residential senior community. Some of her best dance students at Longview are 90 years old, she says. But younger dancers are welcome to join, and Machan encourages her writing students to come to these classes. Publishing is the lifeblood of a writer, and Machan is no different. 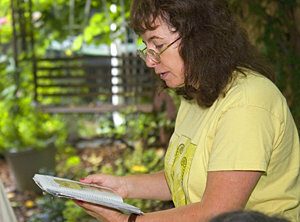 To date she has published 28 books and collections of poetry. Sharona Ginsberg ’08, a former student of Machan’s, says that Machan also encourages her students to try to get their work published. “She continually pushed me to publish and would jot down names of magazines or publishing houses on my work to give me a direction to start. I really appreciated this. It got me thinking about my work on a real and professional basis, rather than as something I was completing for a grade in class,” she says. Machan remains active in the publishing community herself. She is currently collaborating on a project with former Ithaca College student Andre Cuda ’02 called One for the Road, a collection of works about the experiences of writers who have dealt with the impact drugs and alcohol have had on their families.